Below is a brief overview of the many programs offered through the Soccer Club of Ridgefield. If you have questions about how our club runs, this page will try to address any general questions you may have. If you don't find the answer you are looking for, review our menus, or contact one of the Board Members. We will more than happy to help you find the right person to get answers to your questions. Children can participate as a player on an in-town team (less competitive in general) or in a travel team (more competitive in general). For more information on our House Program click here. Travel and Academy 9, 10 and 11 players are required to wear matching uniforms which include an Orange (Home) or White shirt (Away), black shorts and black socks. These may be purchased during the registration process, available exclusively from Soccer and Rugby Imports. For more information on the SCOR Academy program click here. Travel Program: All players must tryout to be considered for a travel team. Travel teams are organized by age group from U-10 (i.e. under 10 years old) through U-19. Ages are as of August 1st of each year. Teams compete in the Southwest District (greater Fairfield County) of the Connecticut Junior - Soccer Association (CJSA) with separate divisions for girls and boys. There are two seasons, Fall which begins play in September and Spring which begins play in April. Teams will provided with a budget to support a tournament, typically these are often held on holiday weekends. 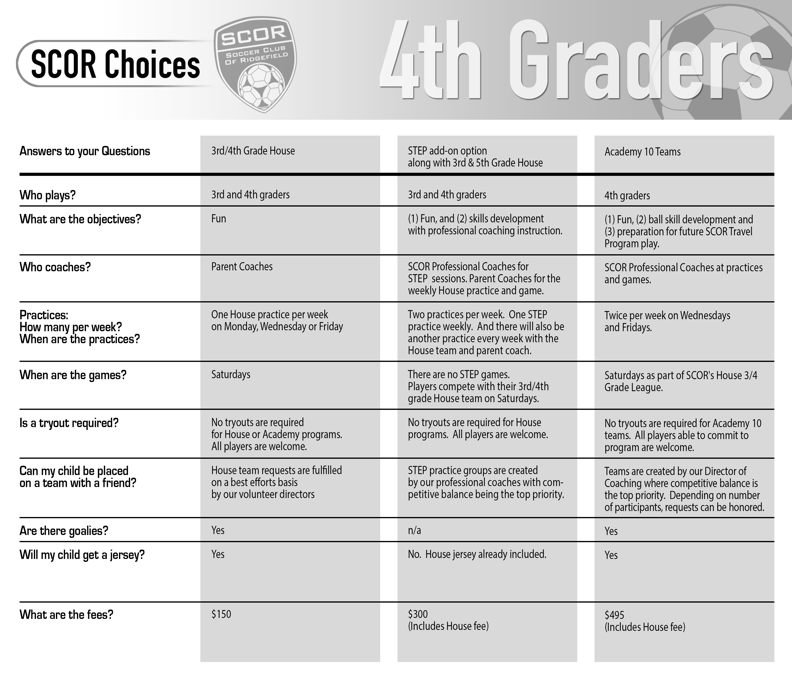 Tournament selection will be facilitated by SCOR in collaboration with the team manager, head coach and parents. Based on coaching recommendations, teams may enter the Connecticut Cup, a highly competitive single elimination tournament. The games are generally held on Saturday and can be anywhere in Connecticut. Travel and Academy players are required to wear matching uniforms which include an Orange (Home) or White shirt (Away), black shorts and black socks. These may be purchased during the registration process, available exclusively from Soccer and Rugby Imports. For more information on the SCOR Travel program click here. Academy 10 & 11 Teams: Players who are not able to participate at the U10 and U11 Travel level but would like the instruction of professional coaches. Games are played with the House divisions click here. Holland: Enables boys ad girls with physical and mental disabilities to enjoy the game of soccer with volunteer mentors click here. 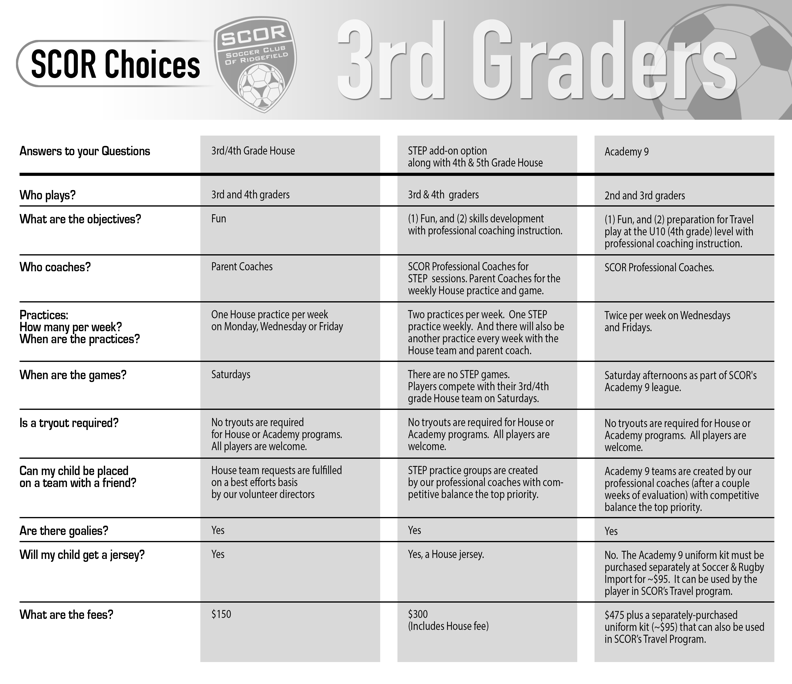 Premier: SCOR provide current U10 and U11players with a Premier Program option click here. 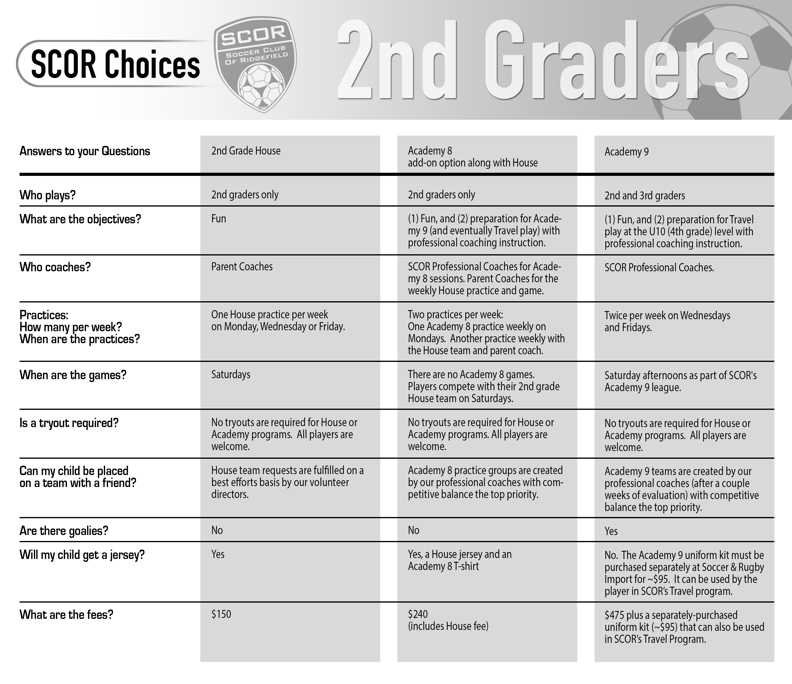 *SCOR also offers supplemental programs for players who want additional training outside of regularly scheduled practices during the Fall and Spring. There are also summer and winter programs. Info is provided during the appropriate seasons. This is a unique program to help players develop their skills and maintain a continuity of progress, as well as provide a fun and healthy activity program for the summer months. Work with the best of Coach Phil Bergen's excellent staff to advance and excel in the player's development. For more information on our Summer Camp Program click here.